A new documentary by Jennifer Kroot and Bill Weber shows why it’s more than“okay” to be Takei: His smile is outrageously contagious. The film, “To Be Takei,” shines a spotlight on the man behind the public persona, especially the delightful idiosyncrasies of his relationship with now-husband Brad Takei. Arts & Life writer Gillie Collins sat down with the directors to learn about their filmmaking experience. A & L: How did you get started making this film? Kroot: I was originally a “Star Trek” fan. I watched the reruns as a kid and really loved them…In 2005, I became very intrigued and charmed by George Takei after he came out and became…an LGBT civil rights activist. He was able to use his celebrity to discuss the issue. He was able to laugh at himself and be very honest about his experience. Then I read his book, which focuses more on his experience being imprisoned as a child in Japanese-American internment camps. I just couldn’t believe that Mr. Sulu had been imprisoned by the United States government at age five. I wanted to connect the dots of all of these interesting experiences and horrible obstacles, so I wrote a letter to his agent…He put me in touch with George and Brad. Weber: I wasn’t a “Star Trek” fan, and I didn’t know that much about George…but I really like the guy now. I don’t just mean George; I mean George and Brad. A & L: Some of the most tender and amusing moments in the film focus on George’s relationship with his husband, Brad Takei. Did you plan to highlight their marriage from the beginning? Or did this angle emerge during filming? Kroot: I was sort of surprised to have it revealed to me through filming that Brad was going to be such a big part of this. It became so apparent to me that they are a very tight couple. Brad is sort of, you know, the great man behind the great man. He’s making all the details happen. He goes with George to all of his jobs and all of his speeches. They live together, they travel together. You know, they have these crazy dynamics — these sort of functional dysfunctional dynamics. Bill often called it kind of a romantic comedy, which is great. I don’t usually like romantic comedies but it’s great in a documentary because, you know, they really are like that. 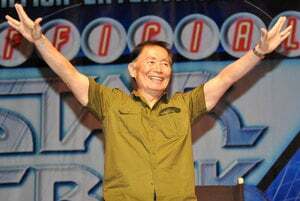 A&L: Since he came out in 2005, Mr. Takei has taken on a leading role in LGBT activism and developed an impressive social media following. What explains this boom in his popularity later in life? Kroot: After he came out in 2005, I think there was a lot of interest in the media [because he one of the] “Star Trek” stars — those are huge celebrities, arguably the biggest pop culture phenomenon of all time. He was then invited to be the official announcer on the Howard Stern show…As a result, he got on more and more TV shows and into some movies. When he started the Facebook campaign to bring awareness to his musical [“Allegiance”], [it] just took off. [His] style of smart humor and sometimes discussing issues or just [posting] cute kittens [was] very appealing to people in a much, much broader way. A &L: In the documentary, Mr. Takei’s positive attitude is palpable and intoxicating. Do you have any sense for how he maintains his energy and optimism? Kroot: You know, he’s just like that — but he also has Brad helping him with the harder details of life. That would make things easier. Bill: One thing that really struck me about George is his curiosity. He’s very curious about people, about places. It’s insatiable. And it’s a positive curiosity. He reads the paper every morning. He loves to go on walks and look at cities and feel how cities are built…In public, he’ll introduce himself and talk to anybody…He’ll go up to people and it’s like, who are you and what are you about? And that’s also really intoxicating. He loves life. And I believe that’s his core. And it’s done him well. A&L: If you had to pick one message for viewers to take away from the film, what might that be? Kroot: I’d say] the reminder of the nature of George and Brad’s relationship. It’s a marriage between two men, these two husbands, who have been together for 27 years now. And everyone can relate to this. Anyone who has been in a long-term relationship or anyone who has…seen their parents in a long-term relationship can relate to this. Bill: For me, it’s about participatory democracy, about the fact that our society and our culture works best if people become involved. Within that, there’s this message of equality for everybody. Overlaying all that are this joy and optimism that exudes out of George. So, you know, I hope people pick up on that — that all of us can get involved in some way — but hopefully too that people just go to the movie and feeling like they had a good time. That they’ve spent this time with somebody — or some buddies — that they really like and enjoy.